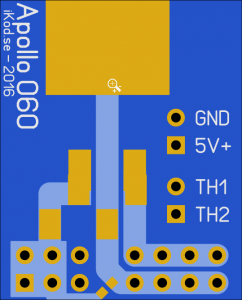 The Apollo 1260 Voltage Regulator is needed when an upgrade is made on a Apollo 1240 from 68040 to 68060 CPU. This is because the 68060 used VCC 3.3V instead of VCC 5V. I based the design around the LM1085 voltage regulator that I find to be very good, but size is a bit bigger than normal. This regulator has been tested successfully with speeds over 80MHz on a 68060 Rev. 6. 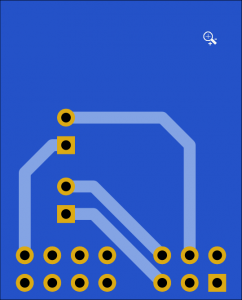 Other than that the design is fairly simple and the part that can be a bit tricky is the 0402 SMD capacitor. Please note that the Female Header can be replaced with a male header and soldered directly to the PCB. The advantage with this way is that it leaves a less higher footprint.